Our August Chef of the Month, Chef Claude has shared with us a fan favorite recipe – his delicious Sicilian Pizza! As the owner of the Pizza Rustica Hollywood location, he is surrounded by pizza everyday. Everyone loves pizza and each person has their own favorite. However, you can never go wrong with a classic cheese Siclian pizza! Get his recipe below to make yours at home! 1. Pre-heat oven to 400 F°. 2. Roll out your precooked dough onto a sheet pan. 3. Add cold tomato sauce that has fresh basil, prasley and garlic on top of the dough. You can buy tomato sauce or make your own! 4. Top the dough and sauce with fresh mozzarella cheese. 5. Cook for 10 minutes. Slice into squares and enjoy! It’s hard to stay ahead of the curve when it comes to trends in the restaurant industry. It’s fast-paced and changes every day; it’s a tough job just keeping up. But there is one trend that has surfaced that is hard to ignore. 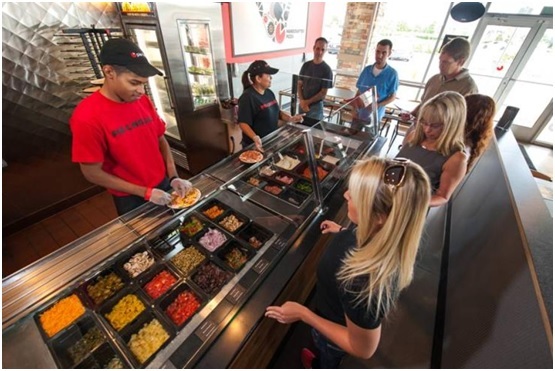 If you haven’t noticed yet, you will now: the rise of the “fast casual” pizza restaurant. For a while, people flocked to fast food pizza chains (which will remain nameless) because of the low price and fast service. They ignored the fact that the reason the prices were so low is because of generic frozen dough and cheap, bulk-ordered ingredients, simply because the pizza was inexpensive. But, as consumers became more and more health-conscious, the need for fresher and healthier ingredients became apparent. That’s when these new restaurant chains, or “fast casual” pizza restaurants as the industry has begun calling them, started popping up. Featuring organic, local and even gluten-free ingredients, and a Chipotle-like experience that allows you to customize your own personal pie, these fast casual chains have begun dominating the gourmet pizza market. People are starting to notice, too. Wolfgang Puck has three Wolfgang Puck Pizza Bar restaurants so far, and “Shark Tank” investor Mark Cuban even bought into the premise as well. It’s only a matter of time before more people get fed up with ingredients that aren’t fresh, and begin to pay the premium price, allowing these fast casual chains to take over the industry. For a list of up-and-coming fast casual pizza restaurants, visit Forbes. So, what’s your favorite gourmet pizza establishment? Don’t forget to come back for more industry updates from ChefUniforms.com!